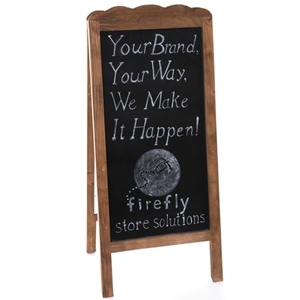 • 2-Sided blackboard 15" x 29-1/2"
Note: Chalk markers not recommended. Love love love the look of the sign but will not stay standing if the winds blows. The first time it blew over the trim across the top broke off and the third time it blew down got ran over in the street. Sign lasted about 2 months.